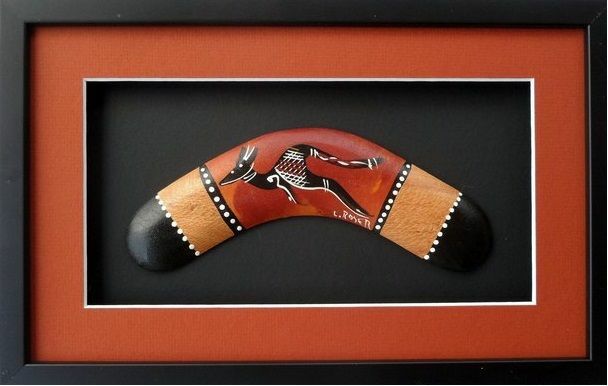 Authentic Australian made 8 inch boomerang presented in a wooden frame, hand painted by by local Aboriginal artists. This Australian made wooden boomerang is made from local native timbers. It is a brilliant indigenous souvenir. Hand painted by Aboriginal artists using traditional dot painting techniques or featuring Australian native animals and rich earthy colours, this wooden boomerang is a fantastic reminder of Australia. 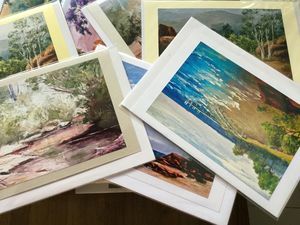 It makes a wonderful Australiana gift to take home or send overseas. Made of sustainably harvested timber this wooden boomerang is one of our most infamous Australian icons and features intricate designs. Framed and mounted on stylish black card this wooden memento is a high quality Australian souvenir. If you are looking for an iconic gift from Australia, then this Aboriginal boomerang is sure to impress.